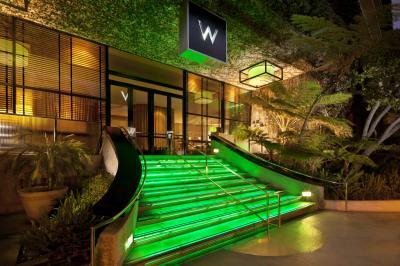 LOS ANGELES—W Hotels Worldwide has completed a $25-million renovation of W Los Angeles–West Beverly Hills, formerly known as W Los Angeles-Westwood. Dawson Design Associates led the top-to-bottom renovation. Drawing inspiration from the bungalows of Beverly Hills, the hotel provides 297 reimagined suites, including an Extreme WOW suite that comes equipped with a screening room. Each suite is designed with sectional sofas and sophisticated lighting, along with louvered windows and filtered light. The property’s signature W Living Room features pulsating lights that sync with the beat from the DJ. Located within a hidden alcove and adjacent to the Living Room Bar, the Oasis is the center of the redesigned space and has a 12 ft. water wall, reflecting changing projections. A new destination restaurant, STK, through a partnership with The ONE Group is scheduled to open this summer, while an updated menu concept debuts at WET, the ground-level pool featuring classic California-style cabanas.